In January 2018, Google had an invite-only event for some of the world’s top C-suite executives. The goal was to illustrate how Fortune 500 businesses can push the limits of what’s possible using Google Cloud technology. 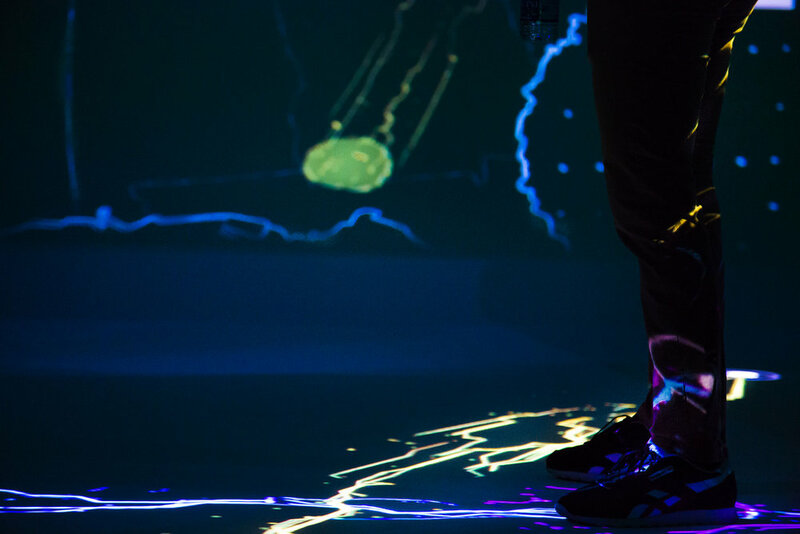 We partnered with them to create a suite of interactive installations hosted at New York’s Milk Studios, and that is currently on tour globally. 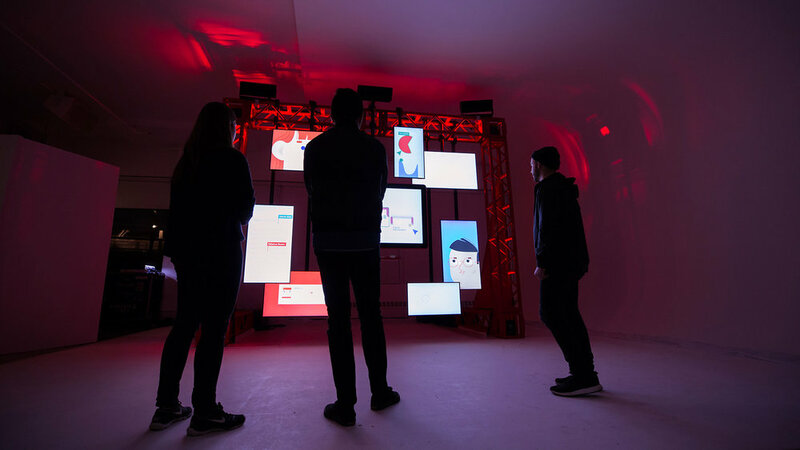 We were asked to design an interactive demo about G Suite, one of the most tangible examples of how Google Cloud supports collaboration and efficiency. In the first room of the event, guests were invited to participate and follow the journey of an idea while experiencing a Rube Goldberg inspired animation. As a center piece of the stage, we had the Google’s Jamboard, a giant 4K digital whiteboard designed for workplace collaboration. 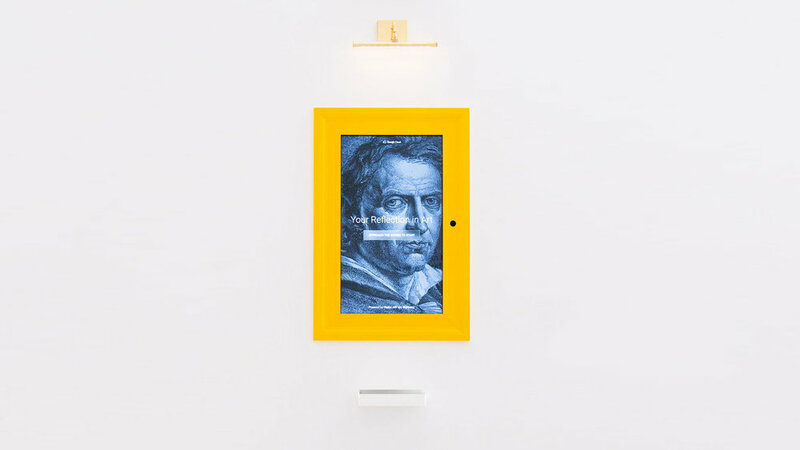 This screen was used for both storytelling and interactivity by touch screen. Surrounding the Jamboard, we used a series of screens fixed on both portrait and landscape mode directly across from our audience on the stage. These are the hero TV elements, on which our story content will be seen. To demonstrate the power of the G Suite apps, we wanted to feel the connective energy of a collaborative process through the screens. The big challenge was how to display 2 minutes of animations on 7 HD screens and a 4K Jamboard. The physical installation setup was recreated inside of After Effects as well as the entire animation. If you want to get more details about the process, please check out the Medium article. Here is an animation sample where we are showing that working together has never been easier thanks to G Suite. Each characters workstation is mirrored in the Jamboard, showing how all are simultaneously connected. In the beginning, Guests got to kick off animation, by choosing three topics from the Jamboard, follow the workflow from Docs to Slides to Sheets, and then tap “send” at the end to launch the idea into the world. This animation sample show the last interactivity of the experience. The Google universe is full of shapes, color and sounds. The perfect playground to create smooth animations, custom physics that add personality to simple shapes and embrace the story. A ball hitting a surface creates a reaction, change it’s color and become a notification. In the next room, guests encountered an interactive art gallery where they could find their doppelgänger in the Metropolitan Museum of Art’s collection. 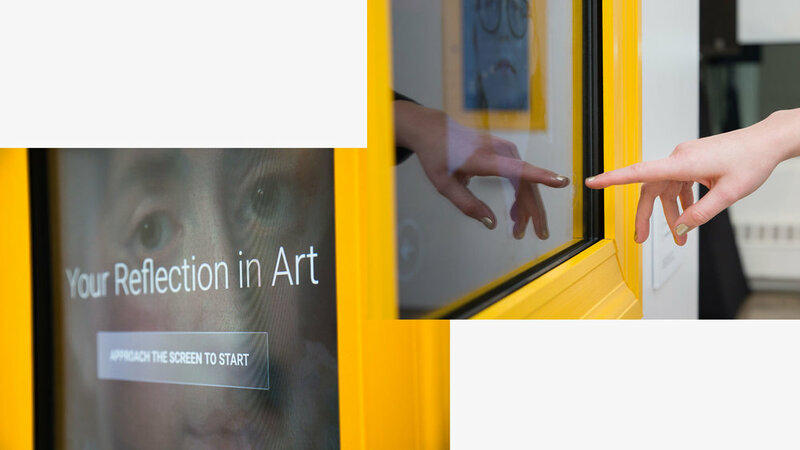 To visualize a match between the user face and his painting, the UI animations were designed by using the constructions lines of an Art piece based on face tracking points. From there, we worked closely with the Creative Tech team to find the best way to implement the animations in the prototype. An ambient state is inviting the users to step up and activate experience. Once the visitor has approached the screen, their face is detected and scanned. The screen act as a mirror tracking your face, serving up results based on your facial data points. Guests walked away from the experience with a printed card of their results, as well as a deeper understanding of how Google Cloud can master complicated data sets. The final room let guests become data and see how Google’s private fiber network helps it move more efficiently around the world.